All VISTA FARMS ESTATES homes currently listed for sale in South Jordan as of 04/24/2019 are shown below. You can change the search criteria at any time by pressing the 'Change Search' button below. "INCREDIBLE HOME- INCREDIBLE LOT! Featuring a separate 4 Car Detached Garage with extra Height! Made for a complete Garage Junkie! Heated main floor detached, with a complete Man Cave/ Entertainment room above! Take a look at the Pics... This 6 car Garage home also has an RV Pad that can hold a full size 50 ft RV! Lets move to the lot... .50 acre lot including a KOI pond, Horse Property, Gravel RV Parking, Detached Garage, Custom Water Feature, fully landscaped and Auto Sprinklers with Secondary water! Backyard PARADISE! Featured on KUTV Backyard Barbecue in 2017! Lets Move inside... 4 Bedrooms, 4 Bathrooms! 2 Fireplaces, Granite Countertops, Free Standing Double Oven, Kitchen Refrigerator included all others excluded. Vaulted Ceilings, Jetted Tub and 3196 Sq Ft. Come take a look at this Custom Gem in the Heart of South Jordan! HORSE PROPERTY!!! 3rd floor square footage is man-cave/entertainment room above detached garage! Buyer to verify all info. " " OPEN HOUSE SATURDAY, APRIL 27TH, FROM 11 TO 2 PM! HALF ACRE LOT - You can have horses, if you want them! 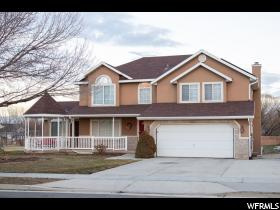 Awesome 2 story home in South Jordan on huge .5 acre lot! 4 bedrooms on upper floor, along with laundry room. Granite tops and stainless steel in kitchen. Beautiful~! New paint throughout home. Large living spaces. Gazebo turret on front porch. Watch the sunsets across the field. 18 solar panels will be paid off. Low utility bills! Roof new in 2015. Such a great home~! Come check it out."